Summary：China may have the lowest college dropout rate in the world. Some chalk this up to the success of China’s rigorous college entrance exam and family support systems. But others say the country’s universities have become too easy and are producing a glut of graduates that are saturating an already dismal job market. 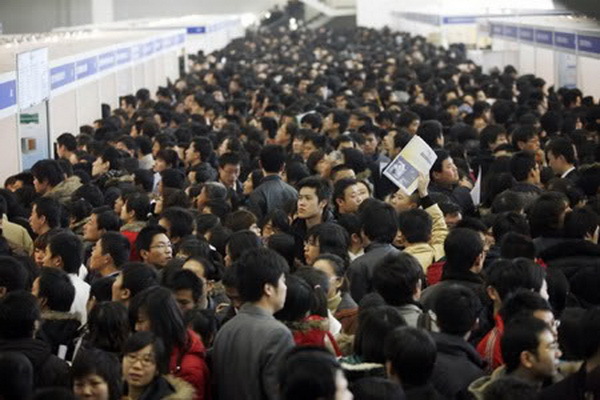 Photo: Students pack into a Beijing college job fair. 97 is a drop in the bucket next to the school’s 43,000 undergraduates; and even of those 97, all but 16 have been given a reprieve allowing them to graduate if they sign a “letter of commitment” to complete their classwork within a year. But that hasn’t prevented the school from taking flak. However, most have supported Shandong University’s move or even criticized it for not going far enough. While many countries lament their soaring college dropout rates, China may have just the opposite problem: Too many people finishing university. Some chalk this up to the success of China’s rigorous college entrance exam and family support systems. But others say the country’s universities have become too easy and are producing a glut of graduates that are saturating an already dismal job market. China’s gaokao is infamous as one of the world’s most demanding college entrance exams. Solely deciding who can access most of the country’s 2,000 universities, it causes years of sweat, tears and unimaginable stress among its 9 million annual takers. But for the fortunate 75 percent who manage to pass, that stress won’t likely to carry over into university study. About 54 percent of the students who enter American universities don’t end up graduating, according to 2010 data from the Organization for Economic Co-operation and Development (OECD). In the UK, it’s 32 percent. Japan has one of the world’s lowest college dropout rates at 11 percent. But China appears to have them all beat. In 2011, the Beijing-based Mycos Institute released a study showing that only 3 percent of China’s university students drop out. The Ministry of Education immediately refuted that “high rate” saying the true proportion was just 0.75 percent. 23-year-old Chuankai travelled from his rural Henan hometown in 2009 to study at a college in Jinan. For his parents, university was non-negotiable. They’d done hard labor their whole lives and would do anything to make sure he got an education. So when Chuankai failed the gaokao, it wasn’t enough to kill the family’s ambitions. They opted to enroll him in a private for-profit university that had just opened. The money he needed for just the first year was more than his parents made from a year of doing migrant construction work. The tunnel-vision Chinese parents have for their child to get a college degree, and thus, a well-paying job that can help support them later in life, usually involves near total financial support. Chuankai says his family’s sacrifices put great pressure on him to get his diploma. However, that wasn’t the only source of pressure. This pressure for students to graduate has shaped the way Chinese universities are run to be relatively strict compared to their Western counterparts. Curfews and travel restrictions are common and undergraduates are all assigned to a Fudaoyuan (辅导员) – a kind of school nanny that ensures students obey rules and study well. College freshmen even begin their university life with two-to-three weeks of military training that’s designed in part to instill discipline and obedience. China’s low dropout rates don’t necessarily mean all students feel fire at their heels to work hard. After the years of toil and stress needed to pass the gaokao, some feel inclined to relax after they’ve conquered what they see as their life’s biggest hurdle. This is an attitude teachers tend to accommodate. In China, there are no such things as “weed-out courses” designed to make underachievers fail. Among foreign teachers, stories abound about school administrations that overturn failing grades without explanation or introduce easy last minute classes for students that don’t have enough credits to graduate. Cheating also plays a role in weak students snatching college degrees. An English language student, who also asked not to be identified, graduated from a Top 50-ranked Chinese university in Nanjing in 2010 and reported that cheating was par for the course among her classmates. For a national English exam they all had to take at the end of their senior year, several students found an ad in a campus bathroom offering to sell the answers beforehand. Li compares Chinese universities to state-owned enterprises of the 1980s, saying they’re inefficiently controlled bureaucracies that have endemic politicking among teachers. Often, he says, professors are more concerned with climbing the ranks and furthering their own careers than taking time to evaluate their students properly. Each year more of these “unqualified” degree-holders join an already overflowing pool of college graduates in the job market. According to the 2012 China Household Finance Survey, 16.4 percent of Chinese college grads under 25 are unemployed - nearly twice the rate of their American counterparts. If more of the 6 million students that graduate from China’s universities each year dropped out before completing their degree (or skipped college in the first place) it would likely improve everyone’s - including the dropouts’ - employment prospects. The same survey found that the less education people under 25 have, the more likely they are to have a job. People with only a high school degree had half the unemployment rate as college graduates. That rate is nearly halved again among those with only an elementary school education. Shandong University’s crackdown on unqualified students may be a sign of things to come for top schools wanting to improve the perceived worth of their degrees. Sang Guoyuan says that at his Beijing Normal University, students now face severe punishments and even expulsion when they’re caught cheating. Some schools have even instituted quotas on the proportion of students that must fail certain classes. But so far, that doesn’t appear to be dissuading many young Chinese from chasing a college degree. At the end of his freshman year Chuankai, the student from Henan, was devastated to learn that his private university had run out of money and its president had disappeared. He and the other students discovered that the school was never officially registered, meaning their time there was wasted. Since his school shut down in 2010, Chuankai has been doing odd jobs like selling school supplies on the street outside universities. He clings to the idea that he might one day be allowed to pursue a degree inside. This summer he’ll take the gaokao again for the fourth time.